I’ve been a fan of the Noun Project for a while. At first as a customer, then as a creator. I started by uploading a few icon rejects from my hard drive. You know, those leftover Illustrator bits all designers have hanging around. Last fall, I decided to take the passive income experiment further. 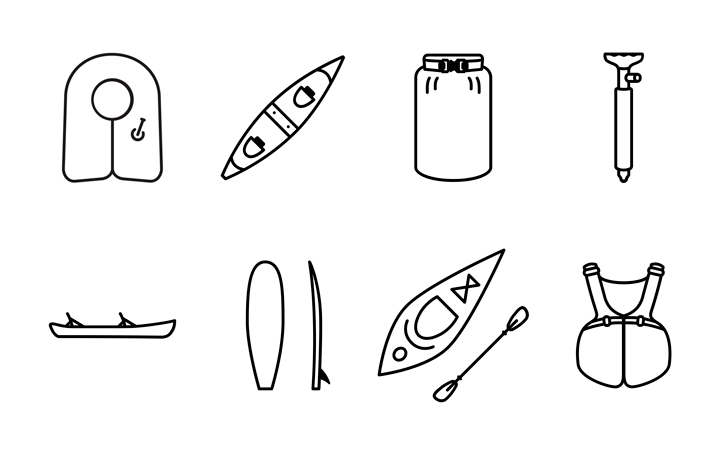 I challenged myself to figure out the Illustrator pen tool once and for all by creating a collection of icons. They say collections sell better, and I wanted to put that theory to the test. I ended up creating two collections: one in outline style and one in fill style. If the first few months are any indication, it’s true. Unlike other stock sites, there’s no way to view by popularity so you can’t game the system. It’s very much set it and forget it for me. It’s a great way to make a little money from your Illustrator graveyard. The monthly “Cha-ching!” royalty emails make me smile. You can’t make changes yourself to your icons or keywords. All changes must be requested by email. There are only two rights options: CC0-No Rights Reserved (Public Domain) or Creative Commons Attribution (CC BY). For the latter, people have to either credit you as the author or pay to use your icon without credit. Unless you upload a massive amount of icons, you won’t get rich. Current rates are single purchase, $1.20 (fixed); subscriptions, 40% of the total shared subscription revenue (last month this was .11); API usage, 40% of the total shared subscription revenue (last month this was .02). Then there are the free downloads. There’s a Google alert on my name, and I’ve never received an alert from an icon credit for a free download. Ever. Last year, I had 4,711 free downloads. So much for the honor system! If I spent a lot of time making these, that would bum me out enough to cancel my account. But for now, I’m content with the warm fuzzy of contributing to the world’s visual language. 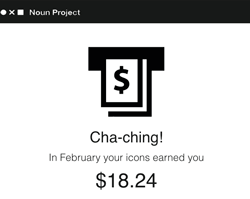 Despite the cons, the Noun Project is a great little experiment in passive income. It blows my mind that a little clock originally made for a client handout in 2013 has been downloaded 5,967 times. The way I see it, it’s like someone handing me ten or twenty bucks every month. Who can argue with that? Have you had any experiences, good or bad, with passive income or the Noun Project?